With about 30 minutes until Wall Street’s closing bell rings the Dow is up triple digits and thisclose to notching its first record close since July 16. The S&P 500 is trading right around 2000 and within a fraction of a percentage point of its own historic high. 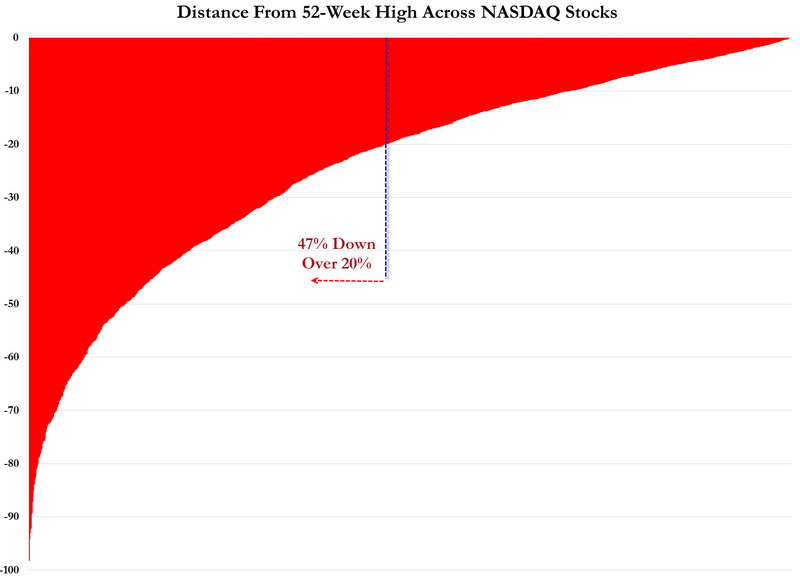 Yet a whopping 47% of stocks that make up the tech-heavy Nasdaq Composite Index are sitting 20% or more below their 52-week highs. Plus, last week the small-cap Russell 2000 Index moved under both its 50-day (intermediate trend) and 200-day (long-term trend) simple moving averages. I'm proud that The Mutual Fund Strategist is one of only a small number of investment newsletters continuously published since 1982. New in 2015: The TSP Strategist, a newsletter dedicated to the government-run Thrift Savings Plan funds. The opinions expressed on this site are those solely of Holly Hooper-Fournier and do not necessarily represent those of Mutual Fund Strategist, Ltd ("MFS"). Ms. Hooper-Fournier is an Investment Adviser Representative of MFS, an investment adviser registered with the States of California and Vermont. This website is for informational purposes only and does not constitute a recommendation to buy any funds, ETFs or stocks, nor is it a complete description of the investment services or performance of MFS. Nothing on this website should be interpreted to state or imply that past results are an indication of future performance. A copy of MFS's Form ADV Part 2a/b is available upon request. This website is in no way a solicitation or an offer to sell securities or investment advisory services. Ms. Hooper-Fournier and MFS disclaim responsibility for updating information. In addition, Ms. Hooper-Fournier disclaim responsibility for third-party content, including information accessed through hyperlinks.